First Line: Only in the very back of my mind, in my most secret dreams, did I ever dare hope I'd have such a moment. For ten years Lucy Richardson has been a librarian at the Harvard Library and engaged (sort of) to her parents' choice of future son-in-law. But that relationship comes to a screeching halt, and Lucy decides to take the opportunity to make a clean break. She moves to North Carolina's Outer Banks to be near her aunt and cousin, and she becomes the newest librarian at the Lighthouse Library. She's doing what she loves in her favorite place in the whole wide world. But when a priceless first edition Jane Austen novel is stolen from the library's exhibit and the chairman of the library board is murdered, Lucy discovers that she's going to have to fight for the new life she's trying to create for herself. I love libraries. I love lighthouses. When I came across this first book in the Lighthouse Library cozy series, my eyes lit up, and when I discovered that "Eva Gates" is the pen name of one of my favorite authors, Vicki Delany, that was the icing on the cake. North Carolina's Outer Banks seems to be one of the hot settings for cozies, and By Book or by Crook fits right in with its neighbors. I liked Lucy Richardson, even though she didn't win any points by staying in a relationship for ten years just to keep her parents off her back. Grow a spine, girl, because I have a feeling that those parents of yours won't be able to leave you alone in your new home! Lucy is surrounded by an excellent cast of secondary characters who are a good mix of supportive and irritating. Fellow librarian Charlene's passion for rap music is a running joke throughout the book, and it's a joke I enjoyed since I personally didn't have to listen to the music. I did find it a tad worrying that Lucy has two prospective beaus. She may not be ready for them yet, but I've learned to treat romantic triangles with a great deal of suspicion, thanks to Janet Evanovich. Another perk of the book is that you really get a feel for what libraries have to deal with in this age of constant budget cuts. The author makes it clear that keeping libraries alive depends on the librarians, the patrons, and members of the library board and city government who all realize how vital these places are to communities. The mystery in By Book or by Crook provides both the high and the low points of the book. The high point? The killer is hiding in the best place of all-- right out in plain sight, and I cannot believe I didn't figure out the person's identity. The low point? I had a very difficult time suspending my disbelief when it came to the lack of security in place at the library for the exhibit of priceless first editions of all of Jane Austen's novels as well as one of Austen's notebooks. I could easily go on in more depth about this, but I don't want to slip and give away too much of the story. Lack of security aside, I really enjoyed this book. 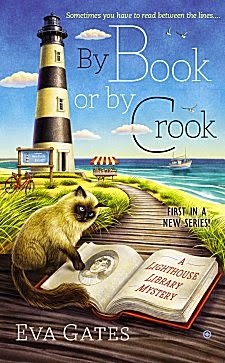 The author took the rather unfeasible idea of putting a library in a lighthouse and made it work with wonderful descriptive passages, an excellent cast, and an intriguing mystery. I'm looking forward to heading back to the Outer Banks for the next book in the series! Cathy - I can see why you were drawn to this. Lighthouses are such interesting places, aren't they? And what's not to like about a books/library context? I'm not much of a one to enjoy suspending too much disbelief, but it sounds like this story is worth that. I kept on reading, Margot, so you know I thought it was! OK, I had been on the fence about this book. Somehow, I've kind of gotten away from the whole cozy side of the mystery spectrum and really, what is a cozy these days? I'm getting distracted. So, I love Vicki Delany's books and I think I will add this one to my Kindle. The library avenue, Jane Austen, Vicki, Cathy's recommendation, and a woman one wants to slap. Sign me up! I seem to teeter back and forth on the fence when it comes to cozies, but somehow they've become a staple (even though I seldom give them A ratings). The clincher for me was when I found Vicki Delany was the woman behind Eva Gates. Sounds like I would love this one..Need to read asap. I hope you enjoy it, Kimberlee!